Japan is home to some of the most competitive yo-yo players in the world and this weekend they choose a new National Champion at the Japan National Yo-Yo Contest! In honor of Japan and their Nationals YoYoFactory produced some limited editions and we are making them available to you in limited quantities! Available is the YoYoFactory ONEStar in a special all black ‘Japan edition’ as well as a YoYoFactory ‘Japan Edition’ T-Shirt. 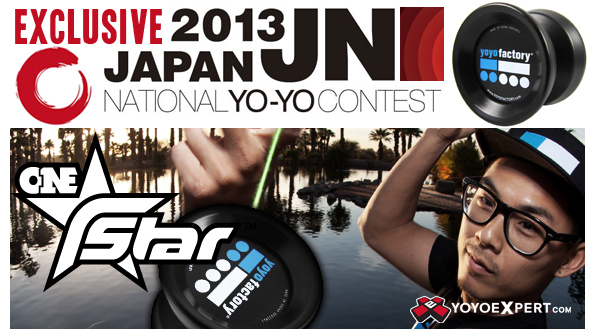 The shirt features a stylish YoYoFactory ‘Japan Flag’ logo designed to honor those in this weekends contest. ALSO – Loop 1080’s have been made available outside of Japan only for the second time! Available are four great colors! Two are colors only previously released in Japan and two are completely new colors that are being exclusively released in person at the event in Japan! Now is your chance to grab some unique YoYoFactory gear all in honor of an amazing country of some of the best competitive yo-yo players. Find them in New Releases Here!